BB Crafts is a one-stop solution for all your decorative requirements. 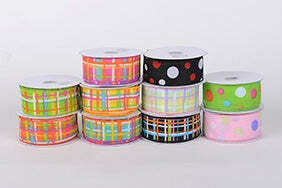 However, you can get all kind of ribbons from our online store at reasonable and wholesale prices. Faux Burlap reflected as the best alternative fabric for Burlap. And also it shows the signs of original burlap in rustic look and fuzzy texture that includes its stylish, natural appearance. As we are ribbon supply store so just have a look at our products, you will be amazed at our supplier's collection. Our faux burlap plaid and dot ribbons fabric are flexible and robust that can easily use for decoration your wedding bridal goods, invitation card, cake, and gifts. It is available in various colors such as Pastel Multi Color, Black, and Light Pink and much more. When you use these ribbons for your craft propose, it gives an elegant appearance to your work. Attempt our online store once and saves on all your art supplies, florist supplies, and Christmas décor. You will be surely come to know that why BB Crafts has become one of the largest suppliers of all things Creative.